Brain Duel Games co-founded by Gaurav Gaggar and Kunal Lalani, launched a first of its kind mind sports league series. A carefully selected array of mind sports including chess, Rummy, e-gaming, Poker & quiz among others have been brought together to attract nationwide talent to take part in the league series scheduled for October 2018. Brain Duel is an open platform where the best in the country from various mind sport disciplines will compete against each other. The competition will be played in a tournament as well as league format across all mind sports categories. The mind sport tournaments will have an open entry structure, where amateurs and professionals can both participate. The selection process will be both online and offline formats. Amateurs competing in the open tournament will have an opportunity to get selected in the future for the league teams as well. Brain Duel hence also acts as a launchpad for amateur players with talent to carve out a future pathway and in turn grow the country’s talent pool across these mind sports. For categories like rummy, it will be the first time in the world that the sport will have its own league. The inclusive nature of the format gives the league a very unique structure, wherein a team owner has the possibility of owning teams across all mind sports and not just one sport or event. Team owner of course has the choice to go for sports of their choice alone also. “It has been my long term vision to host organized tournaments and leagues for all mind sports existing in India. Players participating in skilled-based games don’t always get the necessary recognition they deserve. Through Brain Duel, we shall make an effort to give a much needed structure and platform to all players, who seek mind sports as a potential sporting career. We intend to align ourselves with the official federations and governing bodies for a smooth flow of the league and work with them to create a fan and brand oriented league conducive to the growth of the sport. The structure of the league series has been planned in a way that it reaches out to multiple towns and cities across India,” said Gaggar, Founder & Managing Director, Brain Duel Games Pvt. Ltd. The league format will be team-based, wherein teams representing different regions will compete at the national level for cumulative prizes in excess of INR 5 Crores over a 3-day extravaganza. All teams shall entail a franchise fee, post which team owners can draft players who would go on to represent their teams at the grand finale in October. 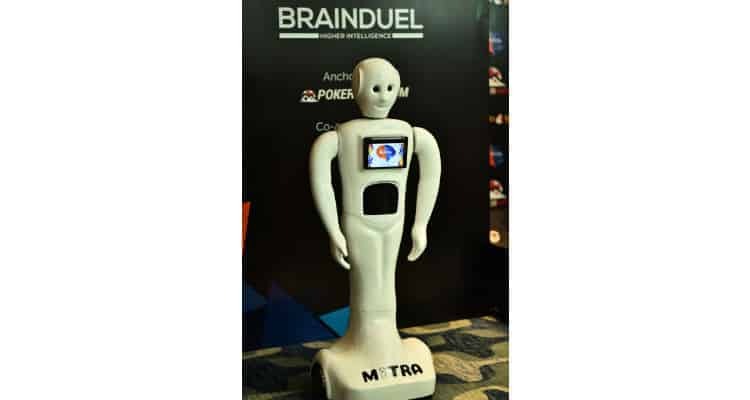 The launch event saw celebrated chess player Tania Sachdev as well as India’s very own celebrity robot “Mitra” unveil the logo of the Brain Duel. With a special guest appearance by Pokerhigh.com’s brand ambassador Bollywood Actor Arjun Rampal adding to the glam quotient of the event. The launch was also kickstarted with a special brain games festival that was hosted as a showcase event. A by-invite Chess, Poker and Rummy tournament were held to familiarize participants and partners to the format.